A large-scale screen in Drosophila cells has shown how RNA interference can provide insights into the pathways controlling cell morphology. When thinking of genetic screens in Drosophila, the Nobel-prize-winning screens for embryonic developmental phenotypes spring to mind. Loss-of-function mutational analysis has proved to be a powerful approach for dissecting complex processes such as morphogenesis and wing development. But historically the fruitfly community has focused much less on the study of cells in culture. All that may now be about to change. In this issue of Journal of Biology , Amy Kiger and colleagues describe the results of a powerful strategy for conducting high-throughput systematic loss-of-function screens in Drosophila tissue-culture cells (see 'The bottom line' box for a summary of the work). The study was led by Norbert Perrimon, a Howard Hughes Medical Institute investigator who runs a Drosophila laboratory at Harvard Medical School in Boston, USA. Perrimon has focused his lab on developing large-scale genetic screens to dissect signal transduction pathways by analysis of mutant phenotypes. The Perrimon lab has a collection of hundreds of mutants with interesting developmental defects, each one waiting for a creative postdoc to track down the gene and work out what it does. "One can assume that genes with similar phenotypes are related and act in the same pathways," says Perrimon. This approach had allowed the lab to define groups of mutants, which have then been used to dissect conserved signal transduction pathways, such as those involving the Wnt family of intercellular signaling molecules and the Jak-Stat intracellular signal transducers. Completion of the Drosophila melanogaster genome-sequencing project three years ago  encouraged the fly community to explore new approaches. "Now we had 16,000 pieces of the puzzle, and working out what they each did was going to be an enormous challenge," says Perrimon. When RNA-interference (RNAi) technology appeared on the scene as a new way of inactivating genes whose sequence is known (see the 'Background' box), it seemed an appealing way to speed up the task of dissecting complex genetic pathways: genes could be systematically inactivated and loss-of-function phenotypes studied on a large scale. But applying the RNAi approach - which had worked so spectacularly in Caenorhabditis elegans [3, 4] - to Drosophila proved not to be so straightforward, and early attempts at injecting interfering RNAs into embryos were plagued by technical problems and inconsistent results. It was not until Jack Dixon's group at the University of California in San Diego showed that gene silencing by RNAi works well in fly cells in culture  that the stage was set for a screen on the scale that fly geneticists are used to. "The cell biology community has a real 'nuts and bolts' view of the way that nature works," says Buzz Baum, who was a postdoctoral fellow in the Perrimon group. "Lots of cell biologists were beginning to use RNAi [when we began this work], but they still hadn't learnt to think as geneticists. What I wanted to do when I joined Norbert's lab was to take genetics to cell biology." So, he and Amy Kiger began to set up the methodologies for a large-scale screen. "We began exploring ways in which RNAi in cell culture could be used in a much more far-reaching way," recalls Amy Kiger, a postdoc in the Perrimon lab and lead author on the study. "We needed to set up a pilot screen to work out the methodologies," says Perrimon. "We were interested in genes involved in morphogenesis, so we decided to focus on changes in cell morphology and genes that regulate the cytoskeleton." They hoped that some of the genes identified would be on the same pathways as those that they had already studied in flies. The Perrimon group was fortunate to be surrounded by a number of laboratories with experience of cell-based screening and robotic technologies, including automated microscopes. "The thing that can be difficult about taking an assay to high throughput is that the way that the cells and microscopes behave can be quite different when you scale up," says Baum, who now runs his own laboratory at the Ludwig Institute for Cancer Research in London, UK. "The most important thing was finding cell lines where we could study the sort of things that we were interested in. We had to learn quite a bit about fly cell culture. We got cell lines from all over the world and tested them with thirty-odd RNAs. We got all these specific cellular phenotypes - it was really quite magical!" They selected two hemocyte cell lines for the screen; these were chosen because of their different shapes - Kc167 cells are small and round, whereas the S2R+ cells are large, flat and strongly adherent (Figure 1). It seemed likely that defining the sets of genes that generated the cell shape in these two cell lines would give clues about basic cell morphology and fly morphogenesis. Images of Kc167 (top) and S2R+ (bottom) cells, from the study by Kiger et al. (reproduced with permission). Wild-type cells are on the far left. Perrimon and colleagues then scaled up operations by constructing a library of double-stranded RNAs (dsRNAs) representing around a thousand genes that could be used as a 'tool kit' for exploring cell morphology phenotypes; the kit included genes thought to be involved in regulating the cytoskeleton, such as putative GTPases and kinases. The library of dsRNAs was introduced into cells in 384-well optical-bottom plates, to allow image-based screening. 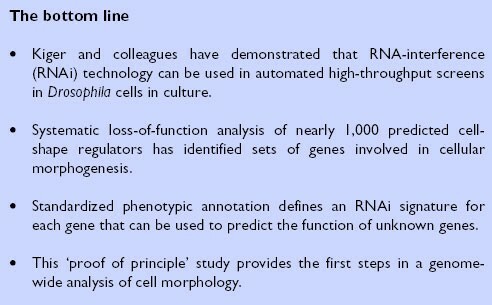 The team recorded all visible changes three days after introduction of the RNA, using automated microscopy. Around 16% of the genes gave visible phenotypes in at least one of the two cell lines. The group then had to work out a formalized process for dealing with all the information that came out of the screen. After familiarizing themselves with the range of phenotypes that appeared, they developed a system of 'phenotypic annotation' to record the effects of silencing each one of hundreds of genes, starting out by defining seven major phenotypic categories on the basis of defects in actin filaments, microtubules, DNA, cell shape, cell size, cell number and cell viability. Each class was then further subdivided into a number of categories that describe specific morphological attributes; for example, changes in cell shape were categorized using descriptions such as round or flat, retracted, bipolar, spiky or stretchy. Obviously these phenotypes overlap in many cases, so that the effects of each RNAi can be defined in terms of its phenotypic profile. Christophe Antoniewski, at the Institut Jacques Monod in Paris, notes that "the use of a 'phenotype matrix' provides an opportunity for statistical analysis of the results using clustering approaches on qualitative traits instead of quantitative traits." As with all genetic screens, genes with similar profiles might be expected to participate in common morphogenetic functions. For example, RNA specific for the Rho1 GTPase and the Pebble Rho-GTP exchange factor, as well as for an uncharacterized predicted kinase (CG10522), all generated enlarged, multinucleated cells, reflecting defects in cytokinesis; Kiger et al. suggest that CG10522 may be a novel effector, downstream of Rho1 and with a role in cytokinesis. The most commonly seen phenotypes were changes in actin organization and cell shape. Several of the genes identified are thought to limit the rate of formation of filamentous (F) actin and encode proteins with F-actin capping functions. Some of these regulators seemed to play similar roles in both the adherent or non-adherent fly cell lines. But by comparing the adherent S2R+ cells with the round Kc167 cells, Kiger et al. were able to study genes involved in maintaining a particular (round or flat) cell shape. They expected to identify a set of genes that were differently expressed in the two cell lines and were responsible for their distinct morphologies. Indeed, they found that 78% of the morphological RNAi phenotypes were seen in only one of the cell types. For example, dsRNAs targeting genes involved in actin filament formation caused Kc167 cells to flatten, whereas dsRNAs for genes involved in cell-matrix adhesion functions caused S2R+ cells to round up and detach. Analysis of the levels of expression of the integrin adhesion receptors, which are known to mediate cell-matrix adhesion, showed that they are not expressed at lower levels in Kc167 cells, although the expression of the cytoskeletal component talin was significantly lower. The authors conclude that both integrin-mediated adhesion and reorganization of the cortical F-actin network are necessary to determine cell spreading. The Perrimon group was very satisfied to see how successfully this pilot screen worked. Having established the 'proof of principle' they have now scaled up to perform whole-genome screens in Drosophila cells in culture (see the 'Behind the scenes' box for more on the development of the work). "It's really changing completely the way we do science," says Perrimon enthusiastically. "Everything now comes down to the assays that we design. You can be as imaginative as you want. We need to do more and more screens and to compile databases of annotated information so that we can build correlations between components of different pathways. The long-term experiment is to see how much of the complexity in the cell can actually be reduced by finding these kinds of correlations." Others in the field agree. "It's exciting to see RNAi technology in cultured cells being adapted to a high-throughput format and being used to screen for genes involved in cell morphogenesis and cytoskeletal function," says Matthew Welch, a cell biologist working at the University of California, Berkeley. "Although the classical genetic approach has been used very successfully for many years to study cell morphogenesis in yeast and other organisms, the ability to systematically silence a large number of genes in cultured animal cells using RNAi has brought this approach to new systems and will help answer outstanding questions in new ways." And Antoniewski concurs. "This type of approach is fascinating because it actually combines both 'forward' and 'reverse' genetics in a single screen. Kiger et al. have coupled systematic knock-down technology to a phenotypic screen, so systematic 'reverse genetics' is guided by the functional assay. This is new and important." Baum predicts that deciphering the meaning of such large datasets will probably require new ways of thinking and the help of mathematicians and physicists. These approaches are being incorporated into the broad field of 'systems biology'. 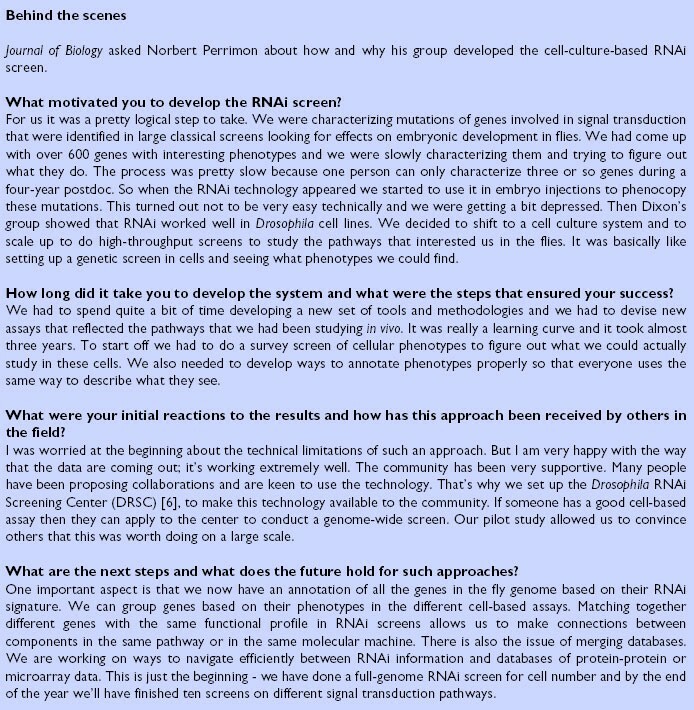 To help the application of this technology throughout the fly and cell biology communities, Perrimon and collaborators have set up the Drosophila RNAi Screening Center (DRSC) , to make the relatively expensive and sophisticated technology accessible to all interested researchers; it also has the advantage of permitting valuable functional comparisons across many studies and the creation of an information database with a standardized format. The DRSC is currently performing screens for cell growth and viability and is accepting applications for potential collaborative screens. "We may need many different assays to dissect a single pathway," says Perrimon. He is interested in any proposal with a good cell-based assay. The Center is able to perform a whole-genome screen in just one week. But at a cost of US$10,000 per screen the DRSC will be carefully selecting screens with a high chance of success. 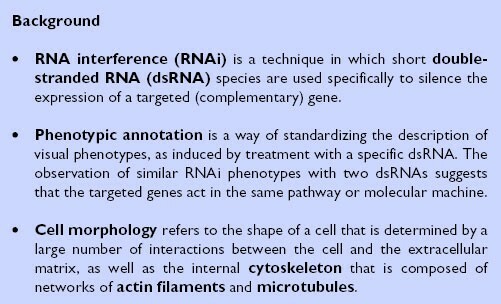 The cell biology community is keen to use the RNAi approach to probe basic questions about cell functions. "This type of approach, like classical genetics, is very flexible and can be applied to a wide range of cellular processes," says Welch. "What's also exciting is that open access to information from large-scale efforts like this one will be extremely useful for other researchers interested in a range of issues, from the function of their favorite gene or protein to more global issues of how gene function is integrated and coordinated during complex processes like cell morphogenesis." And as Antoniewski points out, "in a third of cases, an RNAi phenotype identified a previously uncharacterized gene that lacked a corresponding mutant allele in Drosophila. This is extremely important, because it shows that RNAi screens can identify new functions that could not have been identified by classical genetics using mutagenesis." An additional aspect of the potential for this type of approach is highlighted by Kiger. "Now that large-scale reverse-genetic or 'functional genomic' approaches are possible in yeast, worms and fly cells, it is interesting to consider how we might eventually be able to make functional comparisons across species that could shed light on common (or contrasting) cellular mechanisms throughout evolution." Other groups are using RNAi technology in a more focused way to tackle biological questions. Ronald Vale's group at the University of California in San Francisco has used RNAi targeting specific gene families to investigate cytoskeletal function in Drosophila S2 cells. They targeted dynein and all 25 Drosophila kinesins to investigate the role of molecular motors during mitosis , and also identified sets of genes important for regulating actin dynamics during lamella formation . Rogers et al. suggest, "If proper cues are provided to these cells, cell migration and cell polarity may be amenable to investigation as well." A combination of genome-wide screens and studies focused on specific gene families will be needed to identify and then characterize components of the specific pathways involved in complex cellular processes. It will also be interesting to apply the tricks of the classic geneticists' trade, such as screens for modifiers and suppressors. "I think the power of the RNAi screens will come when we combine RNAi screening data with data from other sources, like genomic sequence, microarray data, proteomic data, and so on," adds Baum. "This opens up the possibility of real systems biology: generating a more global understanding of the logical circuitry that underlies cell behavior. This approach is going to have a big impact - because I think that a lot of the apparent complexity in cell biology is a product of over-expression studies, and loss-of-function data can clarify some of these situations." "And then we will have to go back to the fly," says Perrimon. "The next step will be to take what we have learned from the cell-based assays and validate them in vivo, either using defined existing mutations or by trying to generate them using classical methods or a promising gene-knockout methodology. Or we can also express [RNA] hairpins, which basically give an in vivo RNAi effect." Many of the lessons learnt by classical fly genetics have subsequently been confirmed and explored further in cellular systems. Now it looks as though researchers can begin by doing genetics in cells and then return to the whole fly to investigate further.